You can register callbacks that ReactiveX will call when certain events take place on an Observable, where those callbacks will be called independently from the normal set of notifications associated with an Observable cascade. There are a variety of operators that various ReactiveX implementations have designed to allow for this. RxGroovy has several Do variants. The doOnEach operator allows you to establish a callback that the resulting Observable will call each time it emits an item. You can pass this callback either in the form of an Action that takes an onNext variety of Notification as its sole parameter, or you can pass in an Observer whose onNext method will be called as if it had subscribed to the Observable. The doOnNext operator is much like doOnEach(Action1) except that the Action that you pass it as a parameter does not accept a Notification but instead simply accepts the emitted item. The doOnRequest operator (new in RxGroovy 1.1) registers an Action which will be called whenever an observer requests additional items from the resulting Observable. That Action receives as its parameter the number of items that the observer is requesting. 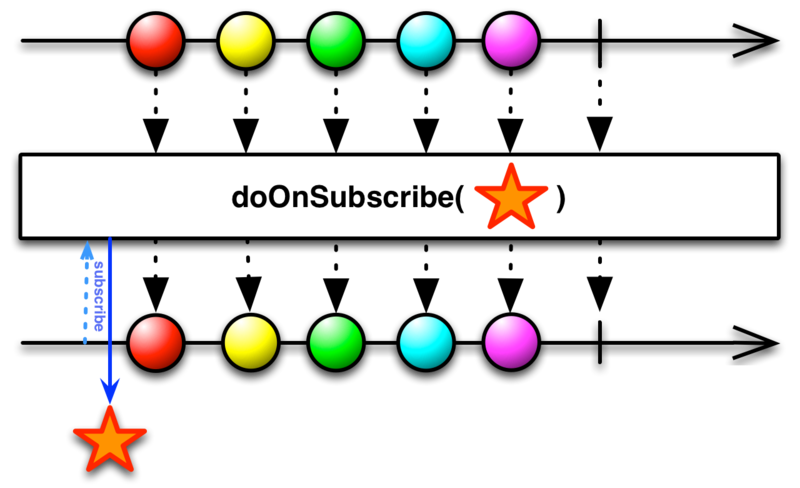 The doOnSubscribe operator registers an Action which will be called whenever an observer subscribes to the resulting Observable. The doOnUnsubscribe operator registers an Action which will be called whenever an observer unsubscribes from the resulting Observable. The doOnCompleted operator registers an Action which will be called if the resulting Observable terminates normally, calling onCompleted. The doOnError operator registers an Action which will be called if the resulting Observable terminates abnormally, calling onError. This Action will be passed the Throwable representing the error. The doOnTerminate operator registers an Action which will be called just before the resulting Observable terminates, whether normally or with an error. The finallyDo operator registers an Action which will be called just after the resulting Observable terminates, whether normally or with an error. RxJava has several Do variants. The doOnRequest operator (new in RxJava 1.1) registers an Action which will be called whenever an observer requests additional items from the resulting Observable. That Action receives as its parameter the number of items that the observer is requesting. finallyDo is deprecated since RxJava 1.1.1, in favor of doAfterTerminate with the same behavior. The doAfterTerminate operator registers an Action which will be called just after the resulting Observable terminates, whether normally or with an error. You can pass it an Observer, in which case do/tap will call that Observer’s methods as though that Observer had subscribed to the resulting Observable. You can pass in a set of 1–3 individual functions (onNext, onError, and onCompleted) that do/tap will call along with the similarly-named functions of any of its observers. RxJS also implements doOnNext or tapOnNext (two names for the same operator). It is a specialized form of Do that responds only to the onNext case, by calling a callback function you provide as a parameter. You may also optionally pass a second parameter that will be the “this” object from the point of view of your callback function when it executes. RxJS also implements doOnError or tapOnError (two names for the same operator). It is a specialized form of Do that responds only to the onError case, by calling a callback function you provide as a parameter. You may also optionally pass a second parameter that will be the “this” object from the point of view of your callback function when it executes. RxJS also implements doOnCompleted or tapOnCompleted (two names for the same operator). It is a specialized form of Do that responds only to the onCompleted case, by calling a callback function you provide as a parameter. You may also optionally pass a second parameter that will be the “this” object from the point of view of your callback function when it executes. RxJS also implements a finally operator. It takes a function that will be called after the resulting Observable terminates, whether normally (onCompleted) or abnormally (onError). RxPHP implements this operator as do. Invokes an action for each element in the observable sequence and invokes an action upon graceful or exceptional termination of the observable sequence. This method can be used for debugging, logging, etc. of query behavior by intercepting the message stream to run arbitrary actions for messages on the pipeline. When using do, it is important to note that the Observer may receive additional events after a stream has completed or errored (such as when using a repeat or resubscribing). If you are using an Observable that extends the AbstractObservable, you will not receive these events. For this special case, use the DoObserver. doOnNext, doOnError, and doOnCompleted uses the DoObserver internally and will receive these additional events. RxPHP also has an operator doOnError. RxPHP also has an operator doOnCompleted. RxPHP also has an operator finally. Will call a specified function when the source terminates on complete or error.